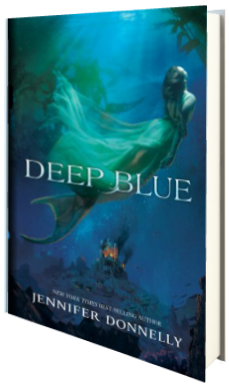 From Goodreads: The first in a series of four epic tales set in the depths of the ocean, where six mermaids seek to protect and save their hidden world. If you’re looking for something completely different, I highly suggest giving Deep Blue a try. Unlike any mermaid novel I’ve read before, this novel takes readers on a chase across the ocean floor as Sera and her best friend attempt to reach the mythological witches from her dreams. As the oceans begin the ultimate war against an unspeakable evil, Sera is whisked away on an adventure that is both harrowing and awesome at the same time. While I will admit the beginning moved a bit slowly for me, as events unfolded and the castle came under attack, the plot quickly picked up and kept my attention. As the plot thickens, we meet six mermaids who must come together and work as one to save the world as we know it, and while this novel only really dives into the circumstances leading up these mermaids ultimate meeting, it was a very fun ride. Set to release in a series of four books, readers focus on Sera in this novel, and her story is one of immense interest. As she and her best friend flee from those who want to use them for evil, Donnelly ties in the land dwelling world as well, giving the story a realistic feel as readers truly don’t know what all goes on beneath them, in the depths of the oceans. While I personally don’t believe in fantastical entities, it was a lot of fun watching Donnelly make connections between our world and theirs, and I enjoyed the novel immensely once it took off. This is definitely a different, unique story—if you’re fed up with the mermaid tales of the past, then definitely give this one a try. Four stars.